LADEE impact site on the eastern rim of Sundman V crater, the spacecraft was heading west when it impacted the surface. The image was created by ratioing two images, one taken before the impact and another after the impact. The bright area shows the impact point and the ejecta (things that have changed between the time of the two images). The ejecta form a V shaped pattern extending to the northwest from the impact point. Ratio constructed with LROC images M1163066820RE and M1101816767RE (NASA/GSFC/Arizona State University). The Lunar Atmosphere and Dust Environment Explorer (LADEE) was launched from Wallops Island on 6 September 2013 at 11:27 EDT and was visible over much of the eastern coast of the United States. The spacecraft was 2.37 m (7.8 ft) high and 1.85 m (6.1 ft) wide with a mass of 383 kg (844 lb) including the fuel. After expending most of its fuel during its successful exploration of the Moon the spacecraft had a mass of about only 248 kg (547 lb) when it impacted the surface. 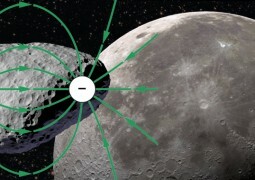 Originally LADEE was placed into a retrograde, near-equatorial orbit to study the Moon’s surface bound exosphere and dust environment. Since the Apollo era of exploration several conflicting ideas and observations concerning the existence (or not) of near-surface and high altitude dust were debated, and thus one of LADEE’s key science goals was to search for dust particles high above the surface (no dust was found). LADEE’s engines were fired on 11 April 2014 to adjust the orbit in such a way as to guarantee a farside impact if the spacecraft did not survive the 15 April 2014 eclipse. There was a small worry that if the spacecraft failed during the eclipse and was uncontrollable, it might impact near one of the Apollo sites. Over the subsequent 7 days, the low point in LADEE’s orbit decreased resulting in an impact on 18 April 2014. As it passed over the western limb as seen from the Earth, the spacecraft impacted the eastern rim of Sundman V crater (11.85°N, 266.75°E). The impact site (11.8494°N, 266.7507°E) is about 780 m from the crater rim with an altitude of about 2590 m, and was only about 295 meters north of its originally predicted location (based on tracking data). 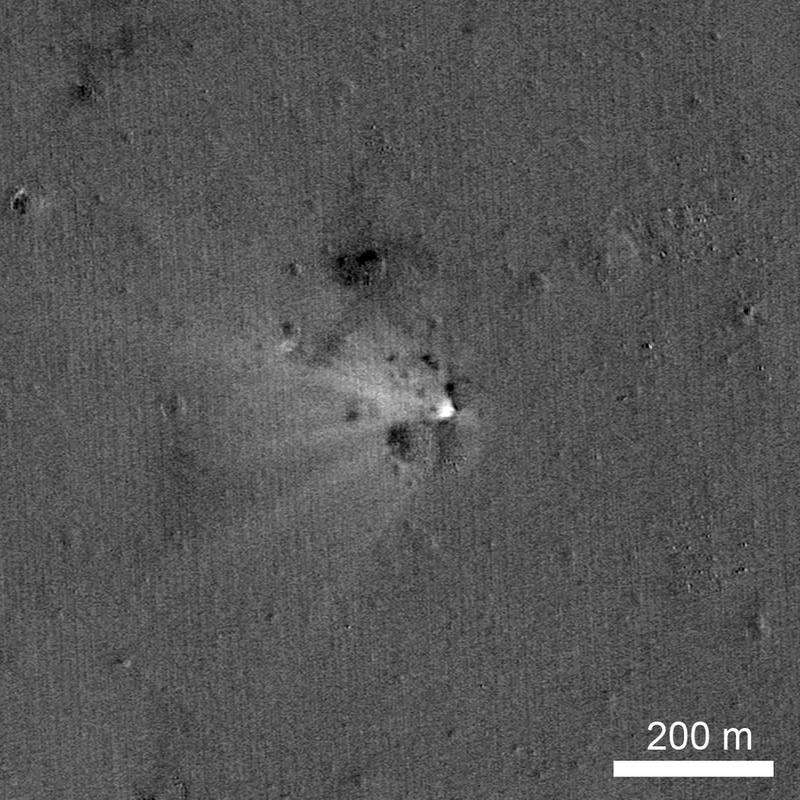 Like the LADEE spacecraft, the impact crater is small, <3 m in diameter, barely resolvable by the LROC NAC. Based on impact models, a crater of only about 1.8 m (6 ft) diameter is expected. The crater is very small because, as impacts go, LADEE had a low mass and a low density (0.43 g / cm3 vs. >3.0 g / cm3 for an ordinary chondrite meteorite), and was traveling at only a tenth the speed (1699 m/sec – 3800 mph) of an average asteroid. Because it is so small, the crater is hard to identify among the myriad of small fresh craters that dot the lunar surface. However, as images had been acquired of the impact region before the impact occurred, they could be compared with images acquired after the impact to identify the crater. Before and after images of the LADEE impact site. Since NAC images are so large (250 megapixels) and the new crater is so small the LROC team coregistered the before and after images (called a temporal pair) and then divided the after image by the before image. In this manner any changes to the surface stick out like a beacon! For the LADEE crater the ejecta forms a triangular pattern primarily downrange (to the west) extending more than 200 meters from the impact site. There is also a small triangular area of ejecta uprange but it extends only about 20-30 meters. The ejecta pattern is oriented WNW consistent with the direction the spacecraft was traveling when it impacted.